Is there one person out there that does not need storage? 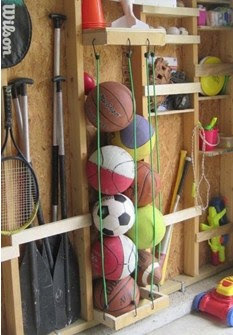 And if you are a sports enthusiast, you must be looking for some cool storage ideas to store all your sporting goodies. We have compiled a list of simple storage techniques that should take care of your sports equipments. 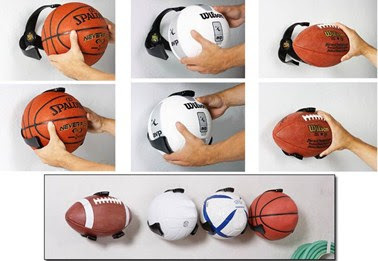 Ball claws are cool gadgets to keep your soccer balls, basketballs and rugby balls intact. You also get a ball claw that fits any ball. Bungee cords can be hooked on a simple rectangular frame as shown above. 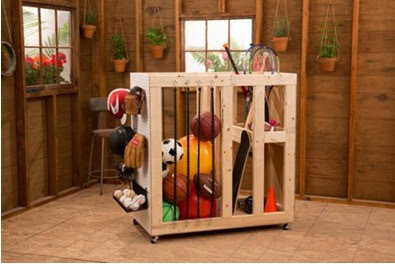 This acts as an extremely useful storage cabinet for storing balls. Also, it is easy to take out the balls whenever required. I personally love the ability of bungee cords to utilize an ignored corner to create an adequate storage space. If you have space, build this rolling cart which is extremely simple to make. Get some wooden planks and bars and assemble them as shown above with some screws. Wall storage proves best for those who have less ground space and many equipments to store and maintain. 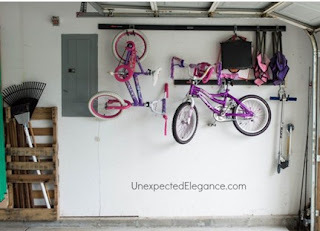 I love this storage trick as with mere wooden planks, hooks and screws, you can make a storage system to keep your bikes hanging. Additionally, you also get specific hooks to support different sports equipments. Finally, if you are looking for a reliable storage provider to take care of your storage needs, Storage In Qatar is always there to serve you.